This article was originally posted on Her Campus Fairfield‘s website on May 5th, 2015. I wrote this article while insanely bored over winter break!!!! If you’re anything like me, coming home from college for winter break is a lot like going to a hot yoga class for the first time. It sounds great- just the relaxing “me-time” opportunity you were looking for. There’s a lot of hype surrounding it, people talk highly of it and you’re excited to finally experience it after such a trying semester. But then when you’re in it, sweating profusely and gasping for breath, you think secretly to yourself, “This is not as fun as I thought it was going to be.” You suddenly feel duped by the hype, you’re convinced you might die at any second and at the end you’re left lying on the floor, feeling physically and emotionally drained and just happy you made it through. So, you know, they’re basically the same thing. 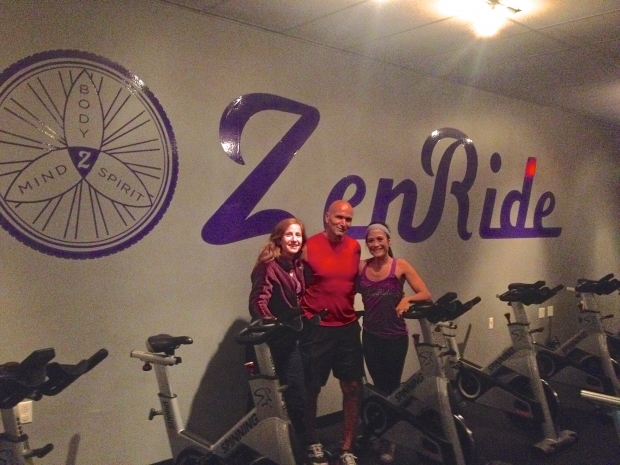 When I walked into ZenRide Spinning Studio, I have to admit, I was a little nervous. It had nothing to do with the budding new Fairfield business, but rather the fact that I had never been to a spin class before. It was one of those things that I’d always wanted to try but had never gotten around to. But after contacting Jessica Gray, the owner and hands-on-operator of ZenRide, I was finally going to find out what spinning was all about! So on Monday October 20th, I logged onto zen-ride.com and reserved my spot in the 7 p.m. TotalBodyZen class. When I arrived a few minutes early, I was greeted by Jessica and her two adorable children, Mason and Dylan. As she started telling me about ZenRide and her personal relationship with spinning (a very positive one, as one would guess), I couldn’t help but notice that she was able to greet and say goodbye to every person by name that walked through the door. To me, that’s something that’s really important, knowing that I’m not just a number, but a person worth recognizing. When she was showing me around the actual spin studio itself, I was a little surprised to see that it had such a calm and relaxing environment; the lighting was low and there were candles set up around the room. All of the bikes were in the middle, facing the front of the room where the instructor’s bike is. Jessica brought me to the bike I’d reserved and showed me how to adjust the bike and also taught me all of the poses that would be referenced throughout the class. By the time 7 p.m. rolled around, I felt prepared (and excited and okay, still a little nervous) for my first ride. I lucked out going to the class that I did because it was with Peter G., a wonderful spinning instructor who was very energetic and outgoing. He went out of his way to make the class a friendly and unintimidating environment. Throughout the 50 minute class, he would call out various instructions about poses and speeds, but always made a point to remind everyone to “do what is challenging and fulfilling for YOU,” emphasizing that everybody should have a personal experience, whatever their level of fitness may be. I was very happy to learn that it was “Mash-up Monday” featuring awesome song mash-ups that Peter had created himself. As somebody who relies heavily on music during a workout, I loved having some original and motivating music to pedal to- it really got me through some harder parts of the workout! Probably my favorite part of the entire class was when Peter belted out the lyrics to “Set Fire To the Rain” by Adele but changed the words to, “And I set fire…. to your legs!” The class definitely got my heart rate up and I was totally covered in sweat by the end of it, but I can’t remember the last time I felt so satisfied from a workout. I highly recommend checking out ZenRide. Not only is it a relaxing yet energizing way to spend an hour of your day, but it is also a great way to spice up your workout routine! With the weather getting too cold to run outside and working out becoming more of a chore than a release, spinning might be a great alternative for you! Plus, it is so close to both the beach and campus (it’s located in the Bob’s shopping center right next to Village Bagel.) Not only does ZenRide offer some great student discounts (seriously affordable), it is also officially accepting StagBucks! Plus, your first class at ZenRide is free, so why not check it out? If you do, be excited for a great experience and make sure you tell Jessica and all of the friendly staff at ZenRide that I say hi! This article was posted on Her Campus Fairfield‘s website on November 04, 2014. Like many girls in college, I find that my mind is constantly racing. Between trying to finish my homework, from “healthy college-budget shopping lists” (which I’m convinced are entirely fictional, by the way), answer e-mails, catalogue everyday encounters as tweets (@MKateItorLoveIt), work out and actually pay attention during class, a typical day leaves my brain whirring like an overheated laptop. Even when I’m not consciously trying to think about anything, the most random things pop into my head. The following are just a few of the recurring thoughts that I, along with many other girls, run into quite frequently. I should really do a juice cleanse. I wonder if anybody will notice that I wore these jeans yesterday… and every other day this week. Okay, I’m just going to sit and write a list of the things I need to do. I need to get my nails done, ASAP. But what color? I wonder what Beyoncé is doing right now. There is definitely some e-mail somewhere that I forgot to answer. Seriously though, how do girls manage to look good at the gym? Teach me your ways, blonde pony-tail, Lulu Lemon leggings girl. *when a friend gives you the latest update about their life* I know, I already saw your tweet/Insta/Snap about it earlier. Blake Lively is literally perfection. I wish I could go somewhere with no WiFi and just disconnect for a while. How many days until Christmas? Which color folder do I use for this class? I can’t tell if this messy pony is messy-chic or like I overslept this morning. Which I totally did. Should I get Chipotle for dinner… again? North West is less than 2 years old and is already more stylish than I will ever be. I still need another coffee. This article was published on Her Campus Fairfield’s website on October 29th, 2014. There’s a lot of reason why syllabus week is awesome. It’s the first time you’ve been reunited with your friends since break, you get to party every night and your teachers don’t expect a lot from you. However one of the major downsides of syllabus week is the cumulative hangover/depression that comes the week after. Here are some tips to help you navigate the harsh reality of post-syllabus week life. Rehydrate. I’m sure it was not water in those red Solo cups. Therefore, it is important you rehydrate yourself with water and electrolytes so that you can resume being a fully functioning member of society. Everybody swears by their own secret: Gatorade, coconut water, Pedialyte, banana smoothies, green tea, just to name a few. A great way to waste a half an hour of your life is to type “hangover cures” into Google and let the crazy/ stupid/ sometimes-useful information just shower over you. Also, don’t let Web MD convince you that you’re dying because you’re not, you are just a hungover slob right now. Call your parents. They are probably worried about you and how you’re faring after syllabus week. Give them a call to assure them that you’re a) alive and b) everything’s fine and c) that those syllabus week pictures they saw you tagged in on Facebook are NOT an indication of how the rest of the semester is going to go. Also remember to thank them profusely for the extra case of Gatorade they insisted you bring. Untag yourself. Your phone has probably been buzzing a lot lately with notifications telling you about the pictures you’ve recently been tagged in. Go on and do some damage control because, spoiler alert, not all of these are going to be gems. It’s also likely that your future employers are not going to think that picture of you gargoyle-ing a keg while wearing a sombrero is as funny as your friends do. Syllabus week is known for yielding fun, memorable pictures, but remember that doesn’t mean the Internet has to catalogue every single one. Reread your syllabi. Take a few minutes to reread the handouts your teachers gave you during the first days of classes because chances are pretty high that for some or all of your classes, you were possibly asleep and/or still drunk. Whip out those highlighters and look over the course requirements. If you want to underline and star the attendance policy, we won’t judge you. Go to the gym. Even if you’re not a big workout person, there is a lot to be said about working out after syllabus week. Not only is it a healthy way to get some endorphins flowing to help you deal with the sad reality of syllabus week being over, but it’s also a great way to sweat out the residual alcohol in your system. Even if you don’t feel like going hard at the gym, just going for a walk and enjoying the fresh air is probably something your body needs right now. Wash your sheets. Just do it. Find a first aid kit and treat those syllabus week wounds. Syllabus week is not particularly known for great decisions or graceful moments, so it’s quite likely you collected a few injuries throughout the week. Twisted an ankle walking around in heels? Took a tumble on the way to the townhouses and skinned your knee? Burned your hand making drunk pizza for you and the random people in your house? It may not have seemed important at the time, but don’t let small stupid injuries turn into actual problems. Organize your stuff. Odds are you when you first got back to school, you didn’t unpack everything. Life, as well as that text inviting you to go day-drink, probably got in the way. Take some time to reorganize your things and arrange your room the way you’ll want to have it for the rest of the semester. Pick up those almost-outfits off the floor, throw out those pizza boxes, untangle those necklaces and confirm that those plastic water bottles on your desk are filled with water and not something else. Sleep. A very important distinction needs to be made between passing out and sleeping- they are not the same thing. Just because you may have lacked consciousness for a few hours every night throughout syllabus week does not mean you were actually getting rest. There are countless studies showing that sleep is critical to health, attentiveness and overall happiness. So turn off your phone a few hours earlier, change into your coziest pair of sweat pants and catch some Z’s. Fairfield University student Lauren Buscone ‘15 was shivering as she stood outside of the Marshall’s on Post Road. She’d just gotten done her night shift at a local restaurant and was eager to get out of the freezing nor’easter snowstorm that had come just days after Hurricane Sandy. She’d been waiting at the designated Fairfield University Stag Bus stop for about 45 minutes in total, assuming that even with delays a bus should have shown up by now. It was only when her smart phone was finally able to pull up the “Stag Bus Locator” webpage that she discovered “Status: Shuttle Not in Service”. She then started the 2-mile walk back to campus. Thankfully, she was picked up on the way by a friend, but other times she has not been so lucky. Buscone is just one of the many Fairfield University students who remain unhappy and frustrated with the operation of the Stag Bus. In an unofficial online survey distributed to 85 undergraduate Fairfield University students, 68% said that they were currently dissatisfied with the means of off-campus transportation provided by the university. Throughout the years, the Stag Bus has been a point of frustration for several Fairfield University students. Since the year 2000, there have been 11 articles written about the Stag Bus by Fairfield University students in the school paper, The Mirror, most of which voiced their complaints and concerns about the Stag Bus. This means that there has been a different story written nearly every year for over a decade. Some of the most popular complaints made by students in the past have had to with how students thought the shuttles were too small, how the daily route didn’t include enough stops and how Fairfield Prep students were taking spots on the bus that belonged to university students. The man who is in charge of addressing issues concerning the Stag Bus is Assistant Vice President of Student Affairs Jim Fitzpatrick. Fitzpatrick, who has been overseeing Stag Bus operations for the past 20 years, says that the university has and will continue to consider student’s comments and complaints in order to make the operation run more satisfactorily. While the term “Stag Bus” might be exclusive to Fairfield University, the concept of schools providing off-campus transportation to students is one that seems to be consistent nationwide. It appears that almost all major colleges and universities offer some form of off-campus transportation. Subsequently, they have their own collection of complaints. For example, Kate Hannigan ’14 of Providence College, claims that their shuttle doesn’t go to locations that students find interesting. Sacred Heart University, another school located in Fairfield, CT, also offers an off-campus shuttle that runs a very similar route and schedule to that of Fairfield University. According to students, there bus is far from perfect as well. One major complaint that SHU students have has to do with the condition of the buses themselves. Currently, the biggest complaint that Fairfield University students have with the Stag Bus is its schedule and timing. The current Stag Bus schedule begins at 11:15 a.m. every day and runs on a 45-minute circuit that starts and ends at the bus stop right outside of the Barone Campus Center. Monday through Thursday, the bus stops running at 10:30 p.m. but on Friday and Saturday it runs until 11:15 p.m. On Sundays, it runs until 7:30 p.m. In the same distributed student survey, 72% of students said that they were unsatisfied with the current Stag Bus schedule. The timing of the Stag Bus has proven to be a significant problem for those students who work off-campus, namely those with jobs in town and those who have internships in New York City. Edward Reilly, an employee of Dattco, the bus company that Fairfield hires to run its shuttle service, has also observed a problem with the Stag Bus scheduling. Students more familiarly know Reilly as the day shift Stag Bus driver. Despite the fact that the university is aware of student’s discontent regarding the present Stag Bus schedule, according to Fitzpatrick there are no immediate plans to change it. As is the case for several departments on campus during these tough economic times, one of the many reasons why no major alterations will be made to the schedule is due to lack of funds. “I would love to run an earlier bus but it’s just not in our current budget,” Fitzpatrick said. Unfortunately, this is not the first time that cost has negatively impacted transportation offered by the university. According to Fitzpatrick, in the year 2009 the university cut funding for an on-campus shuttle that transported students between different locations that are on the outskirts of campus, such as the Dolan apartments and the Dolan School of Business. (See “It’s A Long Road to Dolan” Mirror article). Despite the problems that some students still have with the current Stag Bus, Fitzpatrick claims that things are going better now than they ever have before. According to him, so far this semester he has only received 5 official complaints from students, which is a record low. Even though there are no changes to be made to the schedule in the foreseeable future, Fitzpatrick remains hopeful that alterations that are soon to be made to the “Stag Bus Locator” page, which features a real-time map that allows students to see where the Stag Bus is on its current route, will help students to better plan the timing of their trips. While Fairfield University continues to search for the magic formula to make everyone happy, students will have to make due with the current system.